The Eastern United States to the Midwest. Hickory is much harder than Red Oak. Flooring is normally made from one grade lower of lumber. Thus, #1 Common lumber will make Select and Better flooring and so on. Lumber is graded worst side, while flooring is graded best side of the board. The lumber is defected to yield a higher grade of flooring. Hickory and Pecan lumber are virtually identical and are commonly mixed. Select and Better Hickory flooring is color-sorted to remove dark heartwood, knots, and surface defects such as cracks. Some color variation will be present in the Premium grade, but it will have mostly consistent color. Select and Better Hickory is also referred to as Premium Hickory. #1 Common Hickory flooring is lightly color-sorted to remove the darkest heartwood. Small dime-sized knots are allowed, as well as mineral streaks. Color variation is allowed in this grade. #2 Common Hickory flooring includes all the character found in the wood. 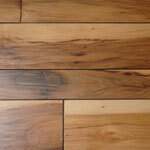 Large knots, white sapwood, dark heartwood, worm holes, and other surface defects are included in this grade. Other common names are Rustic Hickory, Mill Run Hickory, and Tavern and Cabin Grade Hickory. Calico Hickory flooring is made by sorting boards that have only a 40/60 split color or more. Calico Hickory flooring is more expensive than traditional Hickory but is very unique.